We have been in Bangkok for three days now. We flew from Bali on Tuesday on Air Asia. For our first three days we stayed at Boonsiri Place. It is a new hotel which is conveniently located near Wat Phra Keao and The Grand Palace. Unfortunately, I had been coming down with a sore throat over the past few days and a day of traveling did me in. I suffered from strep throat and the flu. Luckily, Sebastien took good care of me and I recovered by Wednesday afternoon. The first attraction we visited was the Wat Po (also spelled Wat Phra). This was within walking distance from our hotel just past Wat Phra Keao. 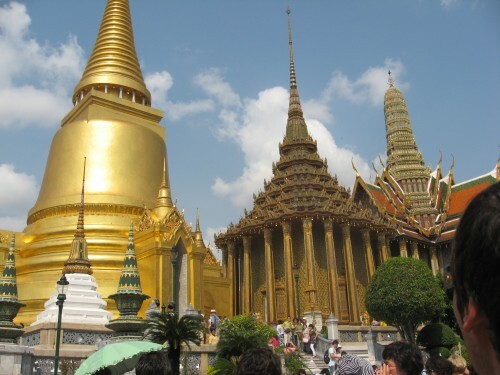 The Wat Po is where the beautiful golden reclining Buddha can be found. There are many different areas within the walls of Wat Po. Some rooms have beautiful sitting Buddhas while other rooms have detailed paintings depicting different stories of Buddha philosophy. The buildings have detailed mosaic patterns with gold incorporated everywhere. The Thai’s know how to use gold tastefully. 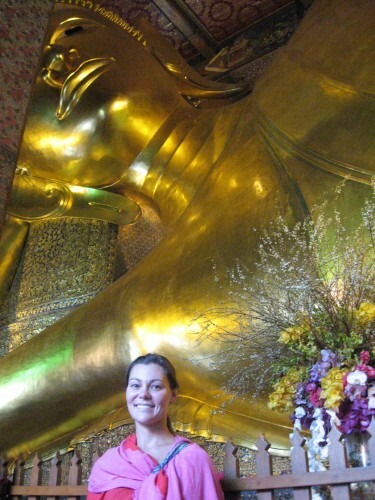 Stepping into the room that was built around the reclining Buddha produced deep emotions. A spiritual feeling and very humbling. On Thursday, we visited The Grand Palace and Wat Phra Kea0. These are also amazingly decorated and designed sites. The Royal Monastry of the Emerald Buddha is located inside the royal residence. 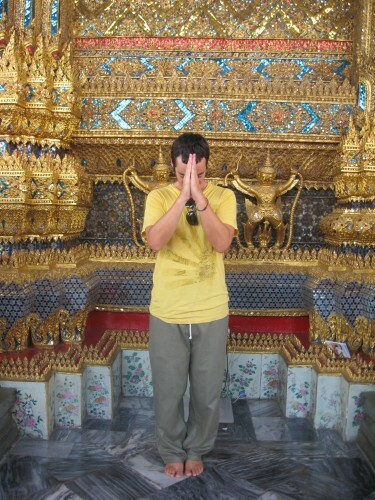 The Emerald Buddha was wearing his winter (hard to believe since it is so hot) robe. It was another spiritual site. Here are some pictures of our visit there. 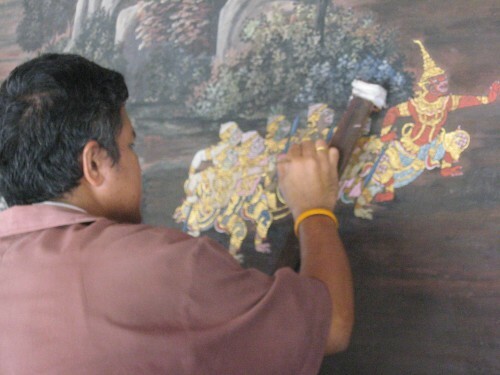 One is of a man touching up the paintings that depict Rama’s reign.